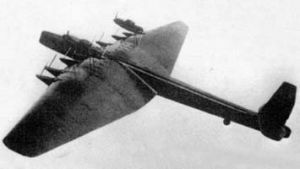 Tupolev TB-6 (internal designation ANT-26; Russian: Туполев ТБ-6/АНТ-26) was a proposal for a 1930s heavy bomber that did not advance beyond blueprints. Inspired by the success of ANT-20/PS-124, Tupolev in 1929 began work on an even larger aircraft powered by 12 engines and with a takeoff weight of 70 tons (155,000 lb). A 1/20 scale two-seat glider was built and test-flown to evaluate the aerodynamic soundness of the design and work was started on the first prototype. By mid-1930s, the trend in military aviation shifted towards smaller and faster aircraft and TB-6 was canceled. ANT-28 was a proposed cargo version.